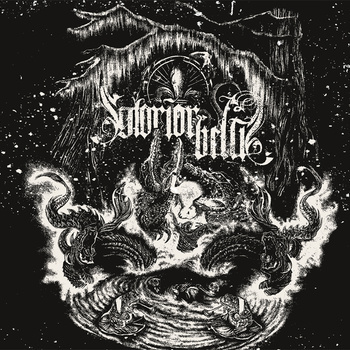 Opening with a Stoner/Doom riff to die for, Glorior Belli know how to get things started. This French band play a Sludge/Black Metal combination with a heavy southern US vibe that makes them both instantly familiar, yet also very unusual. Like that estranged friend you have a bad feeling about from years ago but can no longer remember why. The vocals sound like serrated glass being drawn across stone and are impressively savage. Initially such harsh vocals can seem slightly at odds with some of the more southern-style riffs; indeed the combination of the stoner and Black Metal vibes on the whole takes some getting used to on first listen. Later, you wonder why you thought there was anything untoward going on, as on subsequent listens the transitions from Black Metal atmosphere to all-out Stoner Rock-athon seem much more natural and unforced. In fact; as you listen to the album and get to know it it’s precisely this seemingly-jarring, (at least initially), melding of disparate styles and feelings that elevate this release from just-another-Black Metal album, or just-another-Sludge album. These are the hooks that keep you returning, that lend a far more traditional Metal and Rock swagger to the Black Metal foundation. An album to divide; Sludge fans will probably find this easier to like than Black Metallers, although music is subjective of course and it’s always dangerous to make generalisations or assume too much. Combing the two different genres into Gators Rumble, Chaos Unfurls was always going to be a gamble for the band; I think it has paid off in the main, but the question is will people stick around long enough to accept it? Hopefully. Like someone has smashed together Black Metal and Blues Rock then picked the best looking pieces and rebuilt them together in the form of Glorior Belli. If you can embrace the merging of the styles, (and you should), then you have an enduring album worthy of repeat visits. Try them out! This entry was posted in Black metal and tagged Black metal, Glorior Belli, Metal, Sludge metal, Southern Rock, Stoner Rock. Bookmark the permalink.